Another week another label from those busy folks at AVID Entertainment! AVID JAZZ launches a specialist label featuring legendary and not so legendary jazz greats from the 20th Century! Our aim is to combine where possible classic albums and/or unreleased rare tracks from the archives. Our first release features perhaps an underrated jazz man born in Kansas in 1911, Stanley Newcomb Kenton. Stan labelled the music he made as progressive jazz and it certainly was far from the big band sound of the day played by the likes of Glenn Miller and Tommy Dorsey. 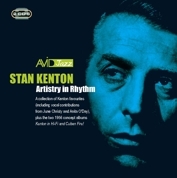 Kenton was the John Mayall of his day and many fine musicians passed through his bands including Kai Winding, Shelly Manne, Stan Getz, Maynard Ferguson, Art Pepper, Bud Shank, singers Anita ODay and June Christy and many more of whom are featured on these two great re-mastered CDs. CD2 features two classic Kenton albums, Kenton In Hi Fi and the dynamic Cuban Fire! Listen and be amazed at an innovative jazz man at the peak of his powers!